Laughter, Romance, and Action Abound in Swept Away, book one in the Trouble in Texas Series. Luke is heading home to reclaim the ranch stolen from his family. But the men who killed his father are working hard to ensure Luke doesn't make it alive. He has no choice but to keep moving. Still, he can't just abandon Ruthy, so she'll have to come along. Swept away when her wagon train attempts a difficult river crossing, Ruthy MacNeil isn't all that upset at being separated from the family who raised her. All they've ever done is work her to the bone. She prayed for a chance to get away, and then came the raging flood. Alive but disoriented, she's rescued by Luke Stone...so unfortunately, there are more chances to die in her immediate future. Once again Author Mary Connealy has written an amazing western romance sprinkled with danger, adventure, humor and faith in God. 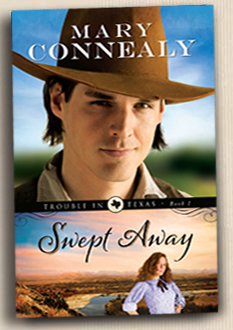 I have previously read several of Mary Connealy's books, and was excited for the chance to read and review Swept Away. I was not disappointed! The story captivated me from page one and kept me reading long into the night to finish. I was so into Luke and Ruthy's story that when it ended I was not happy to be done reading. I decided to go back and re-read the first three series that I'd read by Mary Connealy: Lassoed in Texas Trilogy, Montana Marriages Trilogy and Sophie's Daughters Trilogy. Now I'm on fire for the next book: Fired Up, Trouble in Texas book 2 which is due in August of 2013! Ugh, so long to wait! I received one or more items for this review from the sponsor mentioned in the post. All my reviews are my honest and personal opinion and are not influenced nor reviewed by the sponsor prior to posting. If you have any questions or comments, please see my FTC disclosure or Review Policy. Win a Family Swimming Pool on Mom Loves 2 Read!